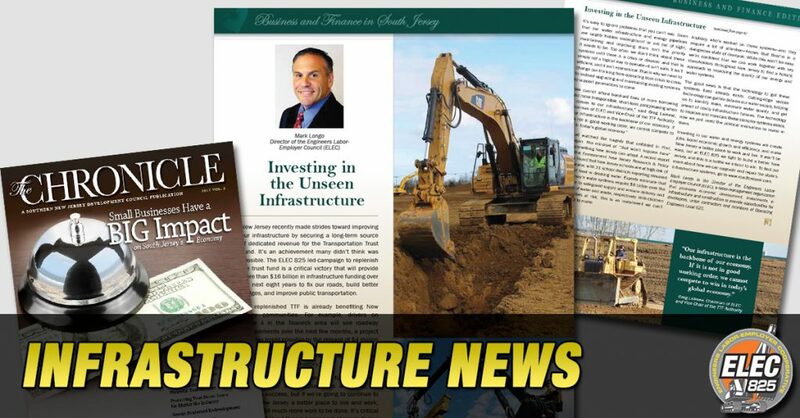 New Jersey recently made strides toward improving our infrastructure by securing a long-term source of dedicated revenue for the Transportation Trust Fund. It’s an achievement many didn’t think was possible. The ELEC825 825 led-campaign to replenish the trust fund is a critical victory that will provide more than $16 billion in infrastructure funding over bridges, and improve public transportation. Securing a long-term source of funding for our transportation infrastructure was a historic, bipartisan success, but if we’re going to continue to make New Jersey a better place to live and work, there’s still much more work to be done. It’s critical we unite behind the next major set of issues facing our state: our energy and water infrastructure. It’s easy to ignore problems that you can’t see. Given that our water infrastructure and energy pipelines are largely hidden underground or are out of sight, maintaining and improving them isn’t the priority it needs to be. Too often we don’t think about these systems until there is a crisis or disaster and that is simply not a logical way to operate—it isn’t safe, it isn’t efficient, and it isn’t economical. That’s why we need to change our thinking from operating from crisis to crisis to instead upgrading and maintaining existing systems to support generations to come. We all watched the tragedy that unfolded in Flint, Michigan. The mindset of “that won’t happen here” isn’t something New Jersey can adopt. A recent report from the Environment New Jersey Research & Policy Center found that New Jersey schools are at high risk of laden-water, with 21 school districts reporting elevated levels of lead in drinking water. Experts estimate that New Jersey’s water systems require $8 billion over the next year to safeguard supply and ensure delivery and disposal of water and waste, respectively. With children and families at risk, this is an investment we can’t afford not to make. Anybody who’s worked on these systems—and they require a lot of attention—knows that they’re in a dangerous state of disrepair. While this won’t be easy, we’re confident that we can work together with key stakeholders throughout New Jersey to find a holistic approach to improving the quality of our energy and water systems. The good news is that the technology to get these systems fixed already exists. Cutting-edge sensor technology can gather data on our water supply, helping us to identify leaks, measure water quality, and get ahead of costly infrastructure failures. The technology to improve and maintain these complex systems exists, now we just need the political motivation to invest in them. Investing in our water and energy systems will create jobs, boost economic growth and efficiency, and make New Jersey a better place to work and live. It won’t be easy, but at ELEC825 825 we fight to build a better New Jersey, and this is a battle we intend to win. To find out more about how we can upgrade and repair the state’s infrastructure systems, go to www.roadtorepair.com. Mark Longo is the Director of the Engineers Labor-Employer Cooperative (ELEC825), a labor-management organization that promotes economic development, investments in infrastructure and construction to provide opportunities for developers, union contractors and members of Operating Engineers Local 825.